X-ray emission spectroscopy (XES) provides a unique probe for the diagnosis of pressure-induced spin transition in materials. HP XES experiments have become a routine technique at 16IDD and have been applied to both 3d transition and rare earth metals and their compounds (Mn, Fe, Co, Ce, Gd, etc.). Resonant X-ray emission spectroscopy (R-XES) studies of transition-metal and rare-earth systems give us important information on electronic states, such as intra-atomic multiplet coupling, electron correlation, and inter-atomic hybridization. In HP R-XES experiments, we use the same setup for XES, but also scan the incident energy across the absorption edge and for each incident energy, fluorescence spectra are collected by scanning analyzers. Recently, we developed a new cryostat used to measure Fe K-beta XES spectra under different pressures and low temperatures. New Fe-based superconductors were successfully measured. This new development will allow us to study magnetic properties and spin transitions of many functional materials (colossal magnetoresistance material, high temperature superconductor etc.) under high pressure and low temperature. 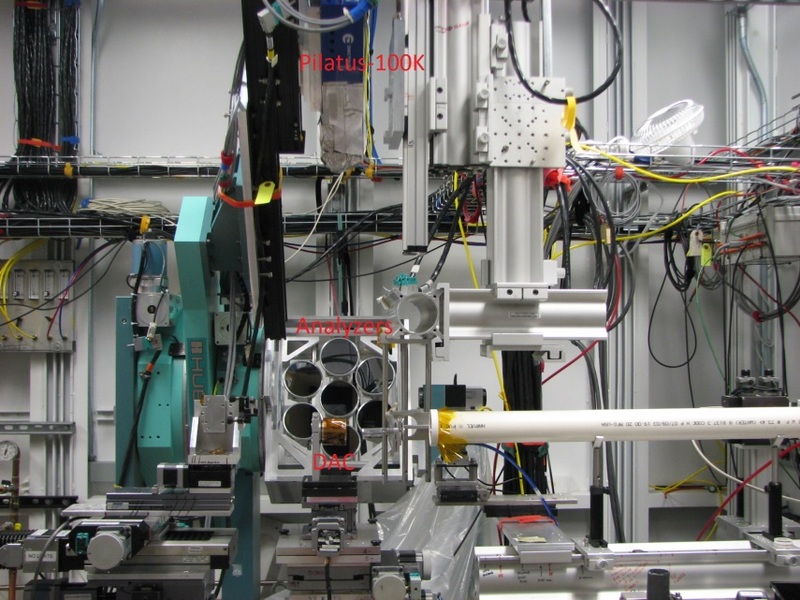 During XES experiments, emitted photons are collected at 90 degrees from the incident beam by a 4-inch analyzer, which focuses and energy analyzes the emitted photons. A range of elements can be studied by selecting from Si(111), Si(220), Si(422), Si (331),Si(620) or Si(400) analyzers. To improve collection efficiency of the XES experiments, we have begun to commission a seven-analyzer XES spectrometer in Aug 2015. The spectrometer is shown in Figure below. The spectrometer has seven 4-inch spherical bent analyzers arranged in a hexagonal pattern to make it compact and accommodate the opening of the most used 2-inch symmetric diamond anvil cells. Fluorescence from the sample is spectrally analyzed and reflected to a Pilatus 100K position sensitive detector by these analyzers. Right now, only 6 pre-aligned emission line can use all 7 analyzers. We are in the process to motorize angle and radial motions of all analyzers to use 7 analyzers for every emission line.